Breaking into the crowded vaping industry is pretty tough for a new company, but I think Tigertek has the right approach – innovation. Their new Springer X RDA is unlike anything I’ve ever seen before. 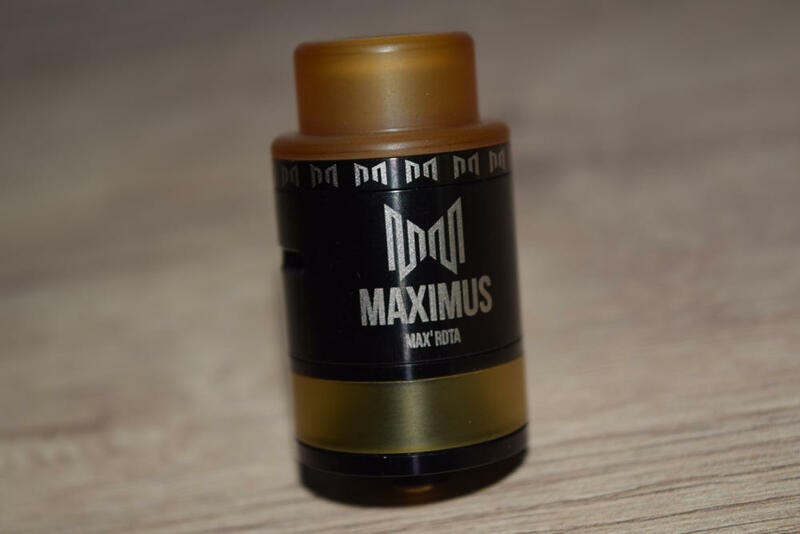 It basically offers a screw-less alternative to the regular RDA build deck, instead relying on strong springs to keep your coil leads in place. 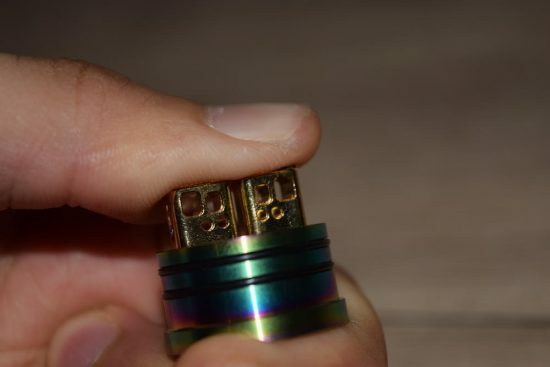 It’s definitely a novel idea, and one that could actually make RDAs more mainstream, as this concept really makes setting up your dripper faster and easier. It’s not every day that we get to see real innovation in vaping anymore, but the Springertek X really has the potential to be a game-changer, so I was really excited that I got the opportunity to try out firsthand and do this review. 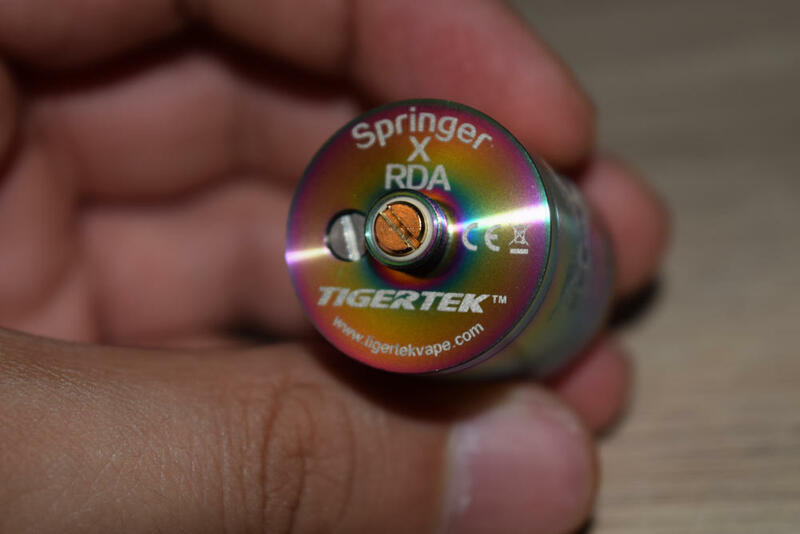 The Springer X RDA comes in an unimpressive cardboard box with just the name of the company, Tigertek, and the “Springer X” logo on the front, and an authenticity seal on the back. 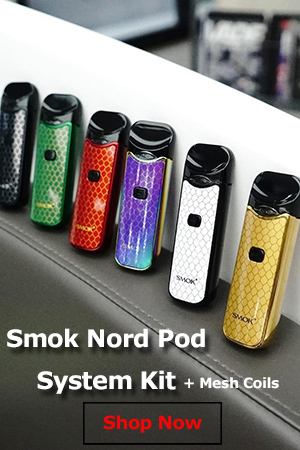 It’s not an attractive-looking package by any means, and it’s a shame, because this device deserves a lot of attention, and as we all know, presentation plays a big part in commercial success, especially in such a competitive sector as vaping. I know Tigertek are pretty new at this, but they’d better learn fast, or they’ll lose some pretty big opportunities. Inside the box, we have the Springer X RDA and a Goon-style Delrin drip tip sitting snug in a Styrofoam holder, and underneath that is a bag of accessories and spare parts. This device comes with spare o-rings, an Allen key, two beefy springs, one Phillips head screw and two grub screws. Now, I know I called it a screw-less atomizer, and it technically is, as these screws aren’t used to hold the coils in place. The kit also comes with a small bag of organic cotton, and two coils, to get you started. I don’t usually pay too much attention to the coils that companies throw in, because they aren’t anything to write home about, but I’ve been running these two coils for a couple of weeks now and they have been phenomenal. Not only do they have a combined resistance of just 0.16Ω, but they seem to be pretty much immune to sweet juices as well. I’ve been using all kinds of sugary e-liquids, and while the cotton has to be changed every two-three days, these coils are as clean as the day I put them in. I don’t even know what material they are made of, but they are among the best coils I have ever used. The Tigertek Springer X is a 24-mm RDA that measures 42.5 mm in height. It’s fairly tall for and RDA, but, just like the Medusa Reborn, that means that is has a very deep juice well, which allows you to vape for longer, without having to drip. 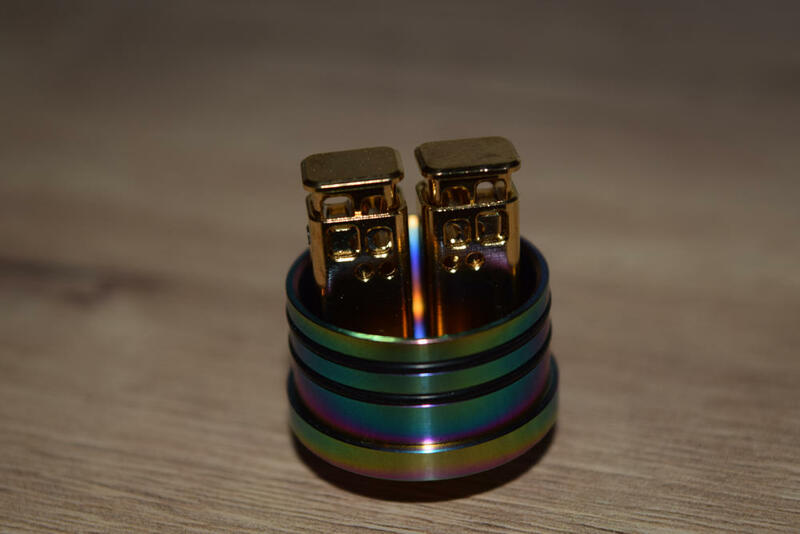 It comes in 4 different colors (stainless steel, black, gold and rainbow), and while the barrel may seem a little flimsy at first glance, the quality of the materials and the machining are actually above average. 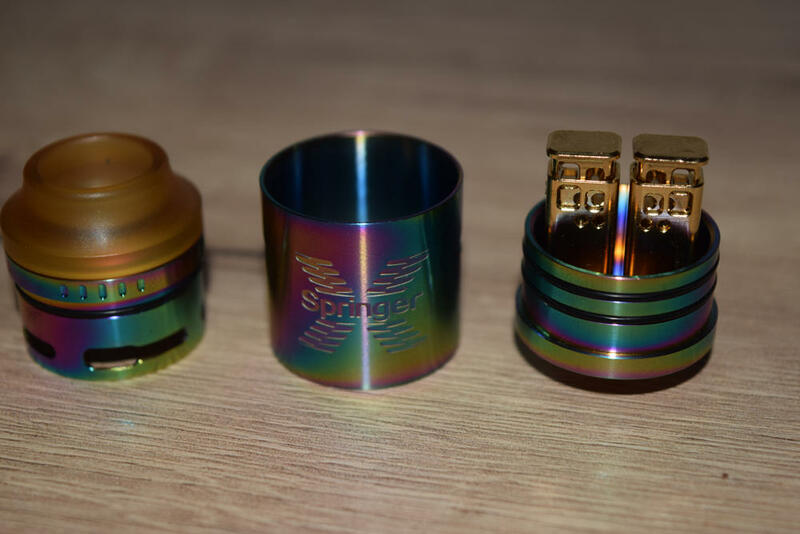 The Springer X comes with a large-diameter Ultem chuff cap which I happen to find ideal for this style of atomizer, but if you just can’t get used to it, Tigertek also includes a Goon-style Delrin drip tip. Just take off the chuff cap, pop the drip tip in, and you’re good to go. Moving on, we have a an airflow control ring, which has just the right amount of tension to it, allowing you to adjust the airflow that comes through the two progressive-size slots on each side of the barrel. 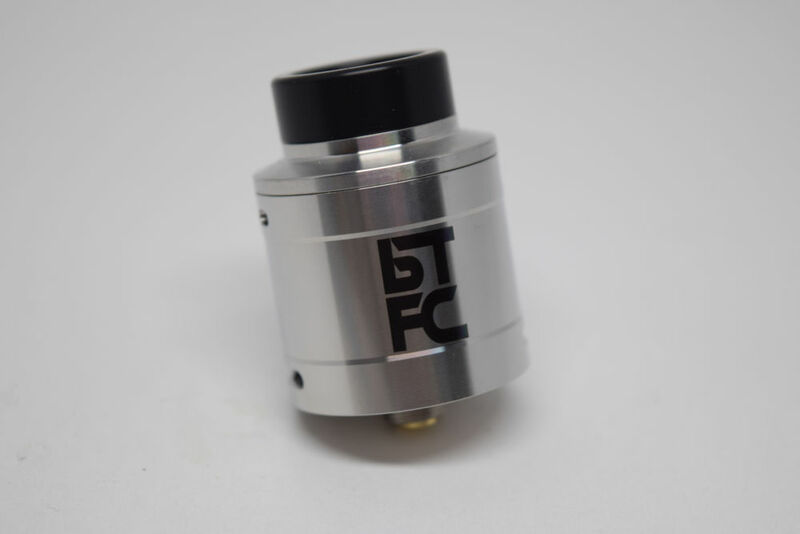 You can also use this atomizer in single-coil mode, by completely blocking off one of the two air holes. On the base, we have a non-adjustable 510 pin, and a flat head screw for removing the negative post, should you need to. This really isn’t the most eye-catching RDA I’ve ever seen. In fact, the only design element worth mentioning is the “X” logo laser etched into the barrel, but the good news is that all the interesting stuff is on the inside. First of all, there is the dome-shape top cap, which is supposed to greatly improve flavor. Then we have a massive juice well that can hold quite a lot of juice, without it leaking through the airflow slots, because they are located much higher up on the stainless steel barrel. 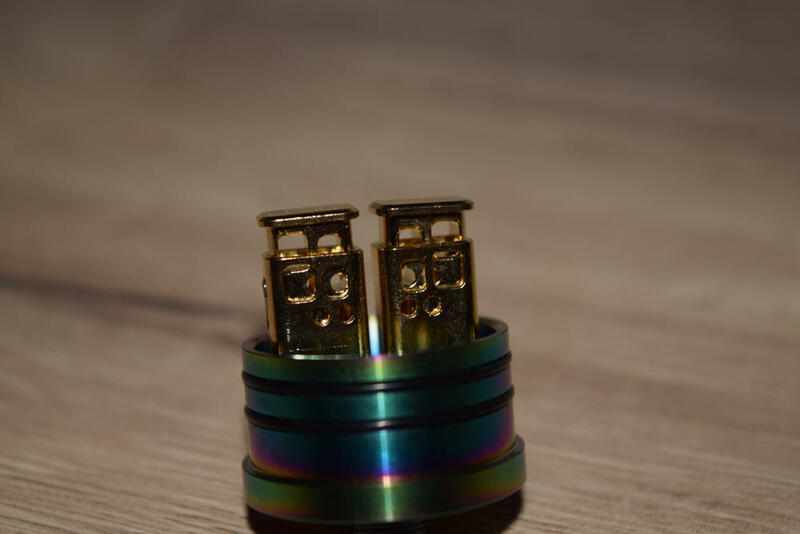 But the main feature of this RDA has to be the design of the coil posts, more specifically the conspicuous lack of screws. The two massive posts of the Springer X both sit on powerful springs, so you have to press down on them in order to align the post holes and insert your coils. Each post has four different-size holes – two for thicker, exotic wire, and two for thinner builds. Once you get the leads through and everything looks good, just release the pressure and the springs lock the coils in place. It’s actually a very simple and effective way to eliminate screws and with them the need to always have a screwdriver on hand, but the implementation is not perfect. In theory, the Springer X RDA screw-less post system is so simple that you can finish a build in only a couple of minutes, cotton wicking included. Just press down on the posts, get the leads through the post holes, release, add some cotton and some juice, and you’re done. 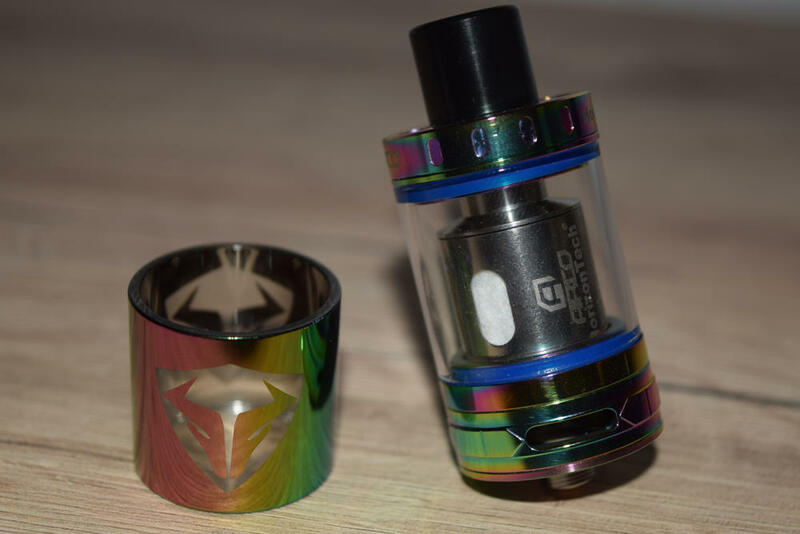 To be honest, if you’re planning on only using this atomizer in single-coil mode, setting-up is literally as easy as it sounds, but preparing it for dual coil use can be quite tricky and frustrating. The main problem, in my opinion is the pressure required to push the beefy springs located under the posts all the way down, in order to align the post holes. 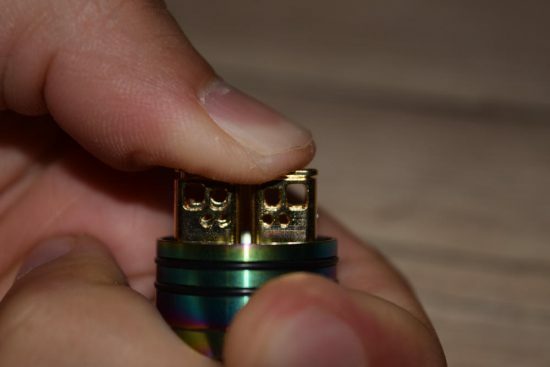 It takes a lot of strength to do that, and even more to keep them both pressed down while you try to install two coils into the same two holes, from opposite sides, using just one hand. I understand why Tigertek had to use strong springs. With them being so close to a strong heat source, weaker springs would probably lose their elasticity very fast, which would render them ineffective in keeping the coils in firm contact with the posts. Still, I’m not sure everyone can exert the pressure required to keep them pressed down enough to get two coils lined up correctly. I’m a grown man, but I had to struggle with the spring system of the posts for a good 15 minutes, before I finally got the two coils in just the right position. It took multiple tries, because just when I was close to getting it right, my start would start shaking due to the pressure, and I either couldn’t keep the deck still, or the holes wouldn’t be aligned correctly. I managed to do it in the end, but it was definitely not as simple as I would have liked. Again, getting just one coil in is a breeze. Just get the leads through the holes, let go of the post, clip the leads and you’re done. But with two coils, it’s pretty hard to do, and I think Tigertek needs to refine this system in order to really make it viable. It’s a great idea, but it needs a bit little bit more work to be perfect. I really didn’t know what to expect from the Tiger X RDA, but it turned out to be a great RDA. 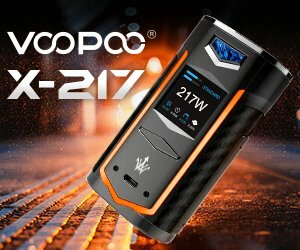 I would compare it to the GeekVape Medusa Reborn, in terms of the vaping experience. It all depends on the build you have installed, but I’ve been using it with those two stock coils at around 90W, and it’s been performing like a champ. Thick clouds and flavor for days is what you can expect from the Tiger X RDA, and having to drip at longer intervals, thanks to the deep juice well is definitely a great bonus. I’ve had no issues with it at all, to be honest. removing the barrel to drip is easy, thanks to the the two perfectly calibrated o-rings on the side of the atomizer base, and leaking is virtually a non-issue, if you don’t overdo it with the dripping. I was quite impressed with the Springer X RDA, both in terms of performance and the innovative alternative to post screws. This was a very bold move, especially for a newcomer like Tigertek, and I’m very excited to see what they come up with next. It definitely requires some refinement to make the dual-coil setup easier and less frustrating, but they are definitely on to something here.